By day, Griff is just a shy, socially inept office worker, easily bullied and ignored. However by night, he turns into a dark-suited vigilante to go fighting crimes and righting wrongs. Unaware of this dual identity, his brother Tim is concerned about his behaviour and whilst trying to get him to socialise more, Griff meets the beautiful but obsessive scientist Melody, who has discovered a way of walking through walls. It's a dynamic team-up that unexpectedly unleashes new found powers that will transform all their lives. A quirky caped comedy that blends superheroics with romance, Griff the Invisible marks the feature debut of Leon Ford, a former actor who has appeared in The Pacific and Hex with Ryan Kwanten (True Blood's Jason Stackhouse)as our mysterious masked man. More in the vein of indie comic-book films such as The Mystery Men and Ghost World but there's a knowing wink towards the likes of the Spider-man/ Batman franchises. He may not be ready to join some avenging super team, but Griff the Invisible is a hero who has to be seen to be believed. Ha ha. 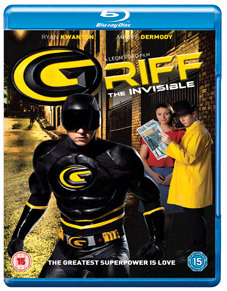 Griff the Invisible will be released on UK DVD and Blu-ray on 16th April 2012 by Matchbox Films at the RRP of £15.99 for the DVD and £17.99 for the Blu-ray.